I thought I would have a little spring cleaning sale over in my etsy shop, the little room. 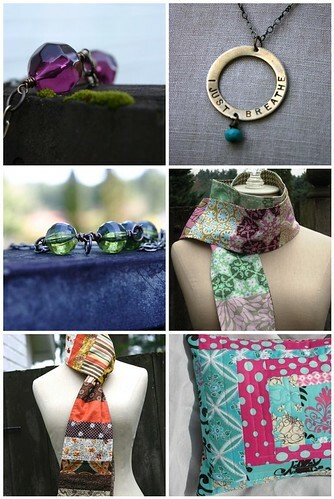 Everything is 20% off the listed price for the next few days. After you buy something through etsy, just wait to pay until you receive a revised invoice from me through paypal that reflects the sale price. This morning, the grey and the rain came back to visit; I found myself sighing thinking it would stay all day. I sent out a little whisper of hope that the sun would push through the clouds a bit, just for a while. This evening, the blue sky peeked out from behind the grey and we have the windows open again to all that spring has brought us. It astounds me sometimes what a little blue sky and the windows open can do for a person, can do for an outlook, can do for a heart. Tonight, I feel hope blooming a bit as the sun shines through the window. As I walk this current path on my journey, this path of grief mixed with beautiful happiness, this path of life, I find letting hope bloom to be a little gift I can give myself. 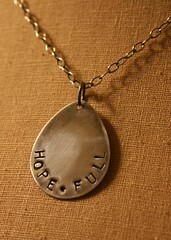 A new soul mantra necklace "hope.full" (spelled in that SARK-inspired sort of way).